Having recently been listed as one of the new 7 Wonders of Nature, Iguazu Falls is one of the most breathtaking sites to behold. With countless waterfalls surrounded by the tropical jungle of Argentina, Paraguay and Brazil, one’s breath will be taken away by your proximity to nature.The vast majority of the Iguazu Falls lie on the Argentine side of the border, within the National Park Iguazu. This side offers the most extensive experience of the Falls thanks to its extensive system of trails and walkways that enable you to go both below and under the falls – most notably the Devils Throat. The surrounding forest also offers excellent opportunities to discover the regions wildlife. 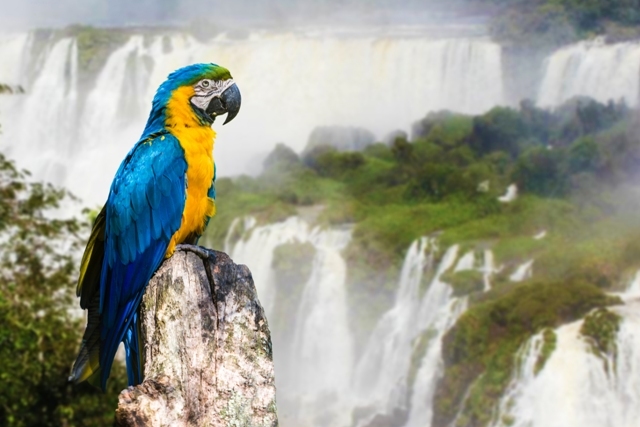 To complete your trip to Iguazu, it is necessary to visit the Brazilian side. Though it offers a more passive experience, the view is more panoramic and provides unforgettable photography opportunities. The Iguazu Grand is the most luxurious Falls accommodations in Iguazu, Argentina. It is only ten minutes from the Falls and very close to the Brazilian border. Located on the corners of Puerto Iguazu (Argentina), Ciudad del Este (Paraguay) and Foz de Iguazu (Brazil), three amazing locations to enjoy an unforgettable vacation, the Iguazu Grand hotel is considered now as the cornerstone of elegance, comfort and entertainment in South America.